She finished primary school in Lonsi and started to attend high school at the public school near downtown Laskowobas. Then she met a man. He was teaching elementary school at the church school near her home. 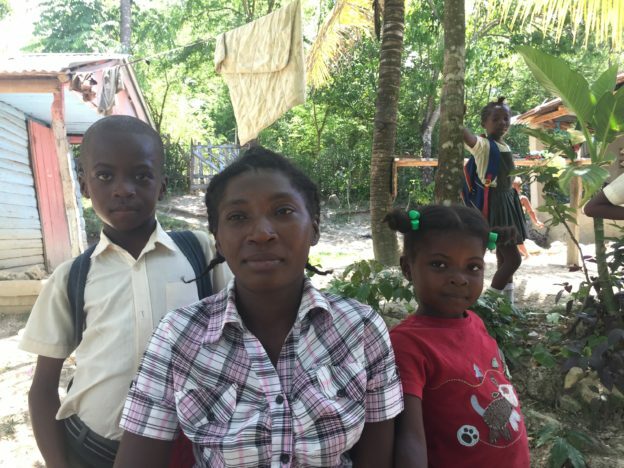 When she became pregnant, he took her to his parents’ home in Lezangle, on the far end of southern Haiti, hours away from anyone she knew. He was away teaching at various schools most of the time, so she was alone with his parents when she had their first child. When their boy was ready, she moved to Petyonvil, where the father had an apartment, so the three of them could be together. Their small family didn’t last long. Elda’s partner began to show signs of frustration. “He was mad because he was earning money, and I wasn’t. I just took care of our baby.” Finally, the man threw Elda out of their home. She took their child, and moved back in with her parents, in Lonsi. At the time, she was three months pregnant with their second child, a girl, but neither of them knew it. When she first returned to her parents, Elda depended on them for everything. “I couldn’t work while I was pregnant or when I had the baby in my arms.” She finally found an opportunity through World Vision, an international non-profit. They included her in a training for rural health agents. She enjoyed the training, and got her certificate, but then World Vision pulled out of the area. Her family took to calling her, “Nurse,” but she never had the chance to do the job she trained for. When Fonkoze’s CLM team met her during the selection process, she had nothing: no assets, no income, no home of her own – just two little children dependent on her for everything. Elda chose goats and small commerce as her two activities, and while she has always taken good care of her goats, her focus was on her commerce from the start. The CLM team made 1500 gourds available for her to start the business, which must have been about $30 at the time, and she knew what she wanted to do from the beginning. She had seen how some of the other women she knew in Lonsi had managed mabi businesses, and she thought she could succeed with one, too. “I decided to sell mabi because you can start with only a little money.” Her case manager, Lénort, encouraged her plan. Mabi is an herbal drink popular in Haitian markets. It’s made from the bark of a tree, which is flavored with cinnamon and vanilla extract. The concentrated liquid is then combined with sugar and served with ice. The final result is a bitter and dark brown. Many Haitians find it refreshing on hot days. Elda needed all of her 1500 gourds to get started. She bought two buckets for 125 gourds each. She’d carry her mabi in one and her cups and ice in the other. She spent 500 gourds on the bark that mabi is made from, 250 gourds on ice, 250 gourds on cinnamon, and 250 gourds on vanilla extract. The business requires a lot of getting around because it sells best in the markets themselves. She can sell in Laskowobas on Wednesdays and Saturdays, Nan Kas on Mondays, and Kwafè on Thursdays, but none of the three markets is especially close to her home. Her business took off. She soon found that she could keep her children fed and in school. When she graduated from the CLM program, she joined a credit program offered by Fonkoze’s sister organization, Fonkoze Financial Services, but she left it quickly, dissatisfied with the service she received from her credit agent and unconvinced of her need for the credit. But she hasn’t been thinking only of herself. Shortly after graduation, she participated in a day-long meeting with about 30 CLM graduates. They got together to discuss their experience and the problem of extreme poverty in rural Haiti. Four of that meeting’s participants were selected to present a workshop at Université Quisqueya, in Port au Prince, that brought together members of women’s groups from various parts of Haiti who were interested in hearing about the situation of the rural women who live in extreme poverty. There was a lively exchange after their presentation, and Elda came away from the meeting impressed by the women she met. When she got home, she decided that Lonsi needed a women’s group, too. So, she formed OFVP, the Organization of Tough Women of Pitifon. Pitifon is the larger region that Lonsi is part of. She felt that she had begun doing well herself, but she could see other women around her who stilled need help. Together with the women she recruited to lead OFVP with her, she would offer council and training based, at least at first, on the lessons she learned from CLM. Eventually she hopes they will be able to attract funding that they can invest in neighborhood development. This entry was posted in After Graduation, Chemen Lavi Miyo on May 30, 2018 by Steven Werlin.